Posted on Fri, Jan 20, 2012 : 5 a.m.
Truman Capote said, "I believe more in the scissors than I do in the pencil." We have a scissors play in bridge. It is not common, but it is fun to execute. See if you can spot it in this deal. South is in four spades. West leads the club six. How should declarer plan the play? South's four-spade response was businesslike. 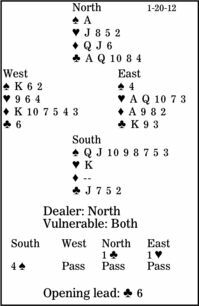 The contract rated to have play; if six spades was makable, partner might have moved; and it provided maximum inconvenience to the opponents. A declarer who plays on autopilot will win with dummy's club ace, cash the spade ace, ruff a diamond in his hand, and lead a sneaky spade seven. However, if West is awake, he will win with his king and shift to the heart nine. East will take that trick, cash the club king, and give his partner a club ruff for down one. Yes, it is slightly unlucky to find West with king-third of spades. However, since West's opening lead is surely a singleton, given that his partner opened one heart, this club ruff is the one risk to the contract. But how can it be avoided? South must stop East from gaining the lead in hearts. At trick two, declarer should lead the diamond queen from the dummy and, if East plays low, discard his heart king. This scissors coup cuts the communication between the defenders. Alternatively, if East covers with his diamond ace, South ruffs, plays a spade to dummy's ace, and leads the diamond jack, pitching his heart when East does not produce the king.